Heading into this Friday’s RFA 8 show, there are no shortage of top prospects, among them Lance “The Party” Palmer. Since making his debut in 2011, Palmer has gone undefeated in his first six fights, including his most recent bout where he defeated nearly 40-fight veteran Patrick Reeves at Showdown Fights 11. “It was more of a filler fight because I hadn’t fought since November, and it felt good to get back in there,” said Palmer. “It was a good fight for me, the guy had a lot of fight, but I went out and got the finish in the first round with a guillotine from mount. While he’s done well in his career so far, Palmer feels the recent addition of a UFC vet to his coaching staff has helped him raise his game to the next level. “It all starts with Duane Ludwig,” said Palmer. “He’s been helping mold me and get rid of my bad habits and pick up some good ones. It’s those additional skills that will come in handy when Palmer faces his most difficult task to date in fellow top up-and-comer Jared Downing (9-1) in what could be a sleeper candidate for Fight of the Year. 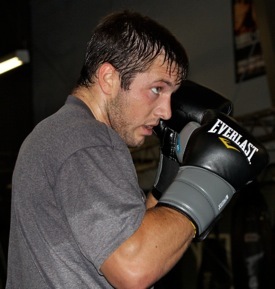 “On the ground, against the cage, anywhere this fight goes, I’ll be comfortable,” Palmer told MMaWeekly.com. “He’s a grinder and is going to want to take it there, so that’s perfect for me. Palmer, along with Downing and RFA 8 headliner Sergio Pettis are considered by many to be fighters who will be taking the next step forward in their careers in the coming months. And even though he’s thought of so highly, Palmer feels nothing is a given, and in order to take that next step, he has to have a standout performance Friday night. “I need a great performance this week and then I’ll take a little break and then see what the next step is from here,” he said. “It all depends on me going out there and getting a victory first.